Scripture presents the prophet Elijah as a man of God, walking continually in God's presence and fiercely defending the worship of the one true God. He stood up for God's rights in a solemn contest on Mount Carmel. Later, on Mount Horeb, he was granted an intimate experience of the living God. 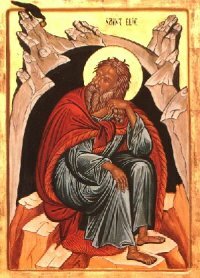 The hermits, who instituted a form of monastic life in honour of Our Lady on Mount Carmel in the twelfth century, followed monastic tradition in turning also to Elijah as their model. Elijah went a day's journey into the wilderness, and came and sat down under a solitary broom tree. He asked that he might die: "It is enough; now, O Lord, take away my life, for I am no better than my ancestors." Then he lay down under the broom tree and fell asleep. Suddenly an angel touched him and said to him, "Get up and eat." He looked, and there at his head was a cake baked on hot stones and a jar of water. He ate and drank, and lay down again. The angel of the Lord came a second time, touched him, and said, "Get up and eat, otherwise the journey will be too much for you." He got up, and ate and drank; then he went on the strength of that food forty days and forty nights to Horeb the mount of God. At that place, he came to a cave and spent the night there. Then the word of the Lord came to him, saying, "What are you doing here, Elijah?" He answered, "I have been very zealous for the Lord, the God of hosts; for the Israelites have forsaken your covenant, thrown down your altars, and killed your prophets with the sword. I alone am left, and they are seeking my life, to take it away." He said, "Go out and stand on the mountain before the Lord, for the Lord is about to pass by." Now there was a great wind, so strong that it was splitting mountains and breaking rocks in pieces before the Lord, but the Lord was not in the wind; and after the wind an earthquake, but the Lord was not in the earthquake; and after the earthquake a fire, but the Lord was not in the fire; and after the fire a sound of sheer silence. When Elijah heard it, he wrapped his face in his mantle and went out and stood at the entrance of the cave. Then there came a voice to him that said, "What are you doing here, Elijah?" He answered, "I have been very zealous for the Lord, the God of hosts; for the Israelites have forsaken your covenant, thrown down your altars, and killed your prophets with the sword. I alone am left, and they are seeking my life, to take it away." and was zealous for the honour due to your name. and bear witness to your love.